The first time I remember hearing of the concept of subscription boxes was when the first wave of beauty subscription boxes came out earlier this year. I remember the genuine buzz around them, and being shocked at the mild hysteria when Boudoir Prive was about to launch and people were competing to get the first box. By July I was signed up to three of the boxes and I watched as my plastic tub of samples in my bathroom grew to unmanageable proportions. It struck me shortly afterwards that I was bought into part of the concept of beauty subscription boxes – receiving a surprise through the post every month – but not the actual products themselves. In truth, I don’t spend a huge amount of money on cosmetics and deep down I wasn’t wowed by being sent tiny sized samples. Paying for a sachet or a tiny vial before I then paid more to buy a full sized product just doesn’t cut it for me. Not long afterwards I cancelled all three and promised myself I wouldn’t sign up to any more subscription boxes until something came along I knew I’d actually use. Enter FoodeeBox. 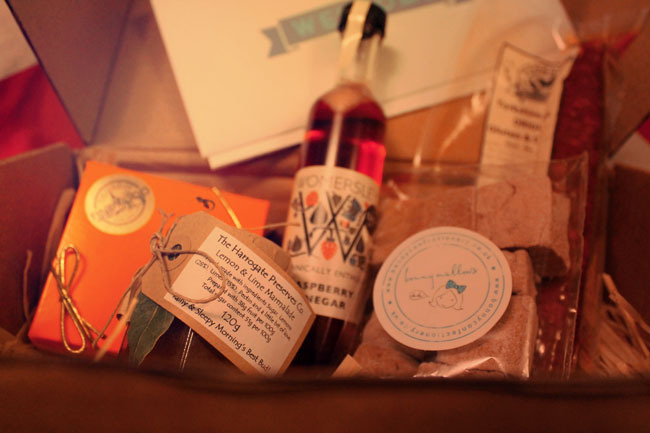 Now, a food subscription box is something I can get on board with. Firstly, you get good sized products so you can really enjoy and try what you’re sent. Secondly they’re gourmet or artisan foods – so it feels like a real treat. Remember when Glossybox sent out Dry Shampoo (a.k.a Batiste-gate) and everyone felt a bit fobbed off? I get the impression that isn’t going to happen here. I was sent a FoodeeBox to try and was really pleasantly surprised with what I received. In my box I received lemon and lime marmalade from the Harrogate Preserves Co, chocolates from the Nut Free Chocolatier, Yorkshire chorizo, Womersley raspberry vinegar and chocolate marshmallows from Bonny Mallows. I had to photograph the box on the day I received it as I wolfed down the chocolate marshmallows straight away, and they were heaven! I’ve also tried the chocolates and the marmalade and both were equally good. 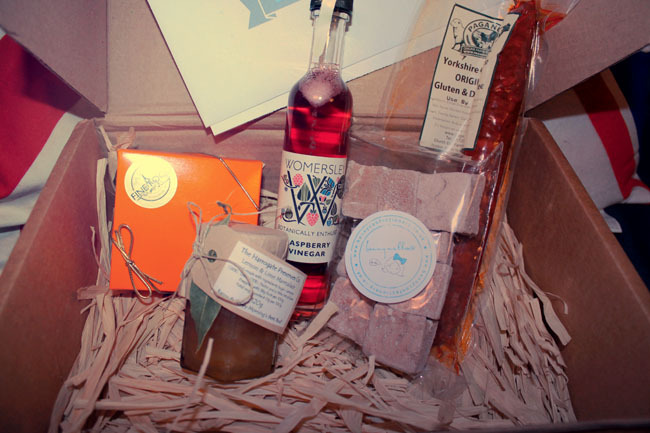 I think the FoodeeBox would make a perfect Christmas present for the food-lovers in your life, and the boxes are really good value. A year’s subscription is £120, making the box £10 a month (never let it be said I’m not a gifted mathematician). Alternatively, a monthly subscription is £15 a month and you can cancel anytime. Subscribers also get foodie gifts, offers and discounts. One of my favourite aspects of FoodeeBox is their ‘Get a box, donate a meal’ concept. They work with UK Foodbanks and for every box bought they donate a meal to the Trussell Trust.